A more spacious and comfortable E63 AMG Estate, the R63 AMG has always been underrated. “The R63 AMG would never have happened on my watch.” This very honest and direct statement was one of the memorable things Ola Källenius said to me during our first conversation soon after his appointment as CEO of AMG in 2010. A brainchild of his predecessor, the R63 AMG was indeed a brand stretch too far. In fact when it was announced at the 2006 Detroit Auto Show most people were astonished that the Board of Daimler had signed off on a model that was so clearly a niche within already small niche. Given that the number of potential customers for a 510hp MPV with a AMG sized premium price tag attached was always going to be miniscule, the chances of recovering the development costs, let alone turning a profit, were slim to none from day one. And so it came to pass. Even though Mercedes only expected to sell around 200 cars a year in the US where it thought most of the customers for a hot rod cross between a sports car and a six-seat minivan would be, even that turned out to be wishful thinking. While AMG will not be pinned down on total sales, rumour has it that less than 200 cars were sold worldwide, with around 30 of these in the US, and just nine in the UK. The US and UK list prices when new were US$88,175 and £74,115 respectively. A significant contributor to the R63 AMG’s lead balloon sales performance was its status as a special order only vehicle that was never supported by any marketing effort. This meant that most people did not even know that the R63 AMG existed, and the resulting dismal sales figures saw it withdrawn from production after just one year. 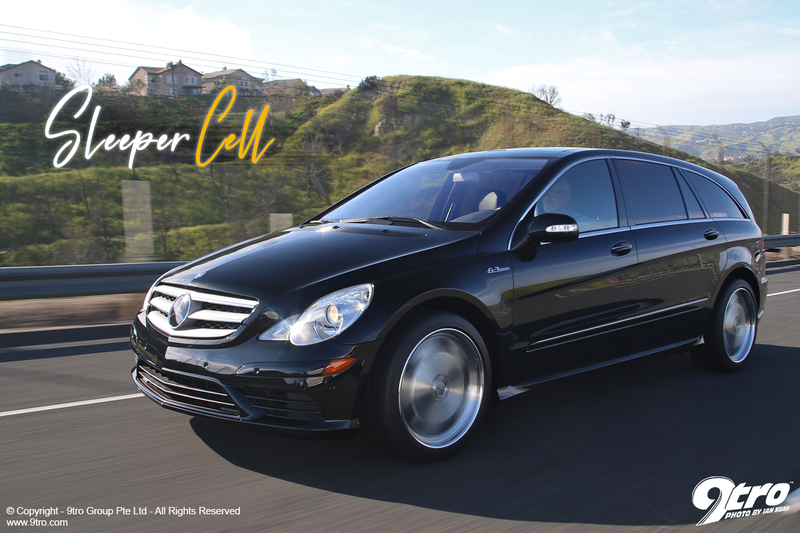 These low numbers make the R63 AMG a rare beast indeed, in fact just the kind of car that appeals to Cameron ‘Cam’ Douglass, Director of Product Development and Marketing at Johnson Controls and Optima batteries in the Los Angeles area. “I collect AMG cars and I also collect US domestic passenger vans,” Cam explained. “The R63 is the ultimate singular expression of both these passions.” As he is a stickler for a garaged car with 100% original paint, solid service history and clean undercarriage, Cam’s search for the right car took over two years. He found this car in early 2018, advertised on the US website Bring a Trailer. “Ironically the car was less than 30 miles away and was being sold by its original owner with just 67,000 miles on the clock,” he recalled. To transform this innocuous looking six-seater into a real street sleeper Cam turned to Michael Weiss at Weistec, whose HQ is less than half an hour’s drive from his Newport Beach home. The goal here was to create the ultimate R63 with upgrades that enhance the performance and appearance without compromising its utility and reliability. “Given the rarity and potential future collectability of car in its original factory state, I also wanted all the modifications to be reversible,” said Cam. 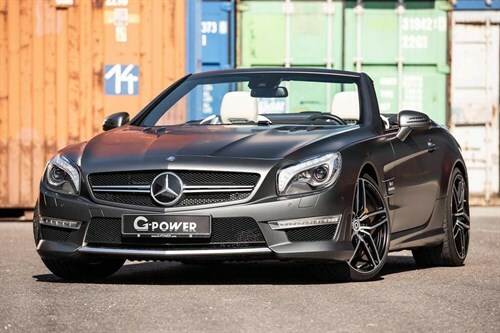 G-POWER Mercedes-AMG SL6314 Feb 2019Tuner breathes 800 horses into the big roadster! 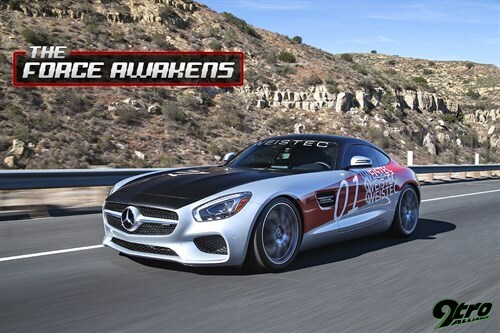 WEISTEC AMG GT S - The Force Awakens09 Dec 2015Simple but effective tuning for AMG’s finest. After discussing possibilities with Michael Weiss, Cam signed off on the Weistec Stage 2 Supercharger conversion for the motor. And in true SoCal custom fashion the next steps would be the suspension lowering module and a decent set of alloy wheels. The stock M156 6,208cc four-cam V8 delivers 510hp at 6,800rpm and 630Nm of torque at 5,200rpm, making it the most powerful production six-seat MPV ever. But if you chose the LWB option, this mighty motor had to pull 2,404kg of dead weight, which did not help its fuel consumption. Despite weighing over 300kg more than the S63 AMG the R63 AMG’s performance is still impressive with 60mph coming up in 4.6 sec (100km/h in 4.8 sec.) and top speed electronically limited to 155mph (250km/h). This sprightly performance is aided and abetted by the 4Matic all-wheel-drive and the close ratios of the AMG Speedshift version of the 7G-Tronic automatic gearbox. While the R63 is significantly more rapid than the R500 or R320 CDI models that formed the staple but still unimpressive sales of this premium MPV, everything changes when Weistec’s engineers bolt on their supercharger unit with its bespoke manifold and drive belt system. To wit, merely fast becomes explosively fast. The blower requires more intake air, which is delivered by European spec air intake boxes containing high-flow air filters. At the other end of the motor Weistec long tube headers reduce backpressure and get the spent gases out as fast as possible. A crossover pipe downstream of the headers balances the gas pressure between the two cylinder banks, the change in gas pulse frequency making the big bore exhaust sound even more aggressive. A comprehensive ECU remap tailored for the new hardware looks after the significant increase in air and fuel entering the combustion chambers, along with the bespoke boost pressure and ignition curves. The result is an increase in output to a solid 700hp, underpinned by 885Nm of torque, all on US spec 91 Octane pump fuel. The factory Airmatic suspension tasked with providing a good ride and handling compromise has the in-built advantage of self-levelling. Combined with the 4Matic all-wheel-drive this control over excessive weight transfer helps the boosted R63 leave the line rapidly with unerring traction and composure. As the conversion had only been completed recently no official performance numbers had yet been taken, but our seat-of-the-pants indicated that a 0-100km/h time of around 4.0 sec was about right, which is pretty awesome for a six-seat behemoth. It certainly felt quick enough to easily smoke most of the junior league supercar poseur types you run into all the time in the Los Angeles area. At the top end of the scale there is enough grunt to send the speedo needle soaring towards the 200mph final indicated number on the dial. However, I am not sure whether to classify that as spectacular or downright scary. The R63 AMG came with 19-inch wheels with the largest optional wheel being 8.5J x 20-inch with 295/40ZR20 tyres. But times move on and Cam fancied a Plus One size increase, while staying with a period AMG design for a stock but larger look. All the R-Class fitment AMG wheels from this era were variations of the five-spoke star design, none of which appealed to Cam who fancied the clean look of the disc shaped AMG II wheel from the 1990s that was never made larger than 18-inch. But this is Southern California, the seat of custom tuning in the US, so it was not that difficult to find a wheel manufacturer to make a bespoke set of 21-inch diameter AMG II look wheels. This turned out to be 10.0J x 21-inch all around, wrapped in 285/35ZR21 Michelin Pilot Sport rubber. Featuring a clear lacquer coat over a perfect machine finish and complemented by polished outer rims these wheels appear factory stock at first glance and significantly improve the visual proportions of this big car. That said, the R63 looks best when you activate the Weistec Suspension Lowering Module that drops the static ride height by 30mm, perfectly staging the big wheels and tyres in the arches. The only disadvantage of this disc design wheel is the fact that it hides the impressive looking and very effective Brembo GT-R big brake kit that features two-piece floating cross-drilled discs clamped by nickel-plated billet alloy six-pot callipers. Cam’s R63 AMG is the perfect embodiment of the ‘sleeper’ philosophy that is the diametric opposite of the loud and proud hot rods that prowl the streets. Even car enthusiasts would not remotely suspect that this big, black six-seat family wagon driven by a mature and well groomed gentleman who might be anything from a bank manager to an engineer could possibly leave their BMW M3 or Nissan 370ZX for dead away from the stop lights. The Weistec modified R63 does that and more. And when Sport mode is engaged, Cam’s intended victims feel the very ground tremble as the spent gases evacuating the free-flowing exhaust system shatter the surrounding air molecules in a muscle car meets family van version of hell on earth aimed right at their fragile egos. Speaking of family Cam says his wife and kids not only put up with his car passion, but also are actively involved in it. “My oldest son and I recently did a GT3 track event at the Porsche Experience Centre, my 14-year-old daughter helps detail the car collection on weekends, and my 12-year-old son hangs out with me at Saturday morning Cars and Coffee events,” he told us. When people can’t have something they want it even more. So despite the R63 AMG being a flop when new a decade ago, its rarity is now starting to boost the residual values of the survivors, especially those in top condition with relatively low mileage. So far Cam has only added 2,000 miles to the car, which is pristine, its metallic black paintwork in near flawless condition, and its spacious interior free of any family type detritus. Right now this is probably the fastest and most powerful R63 AMG on the planet.